It’s that time of year when summer’s bounty is hitting it’s stride in my garden. The beans and peas are winding down. The cukes are still OUT OF CONTROL! And the first tomatoes, peppers, and sweet corn are ready to pick. Eating fresh produce is the main pay off of the many toils and tribulations of having a garden. 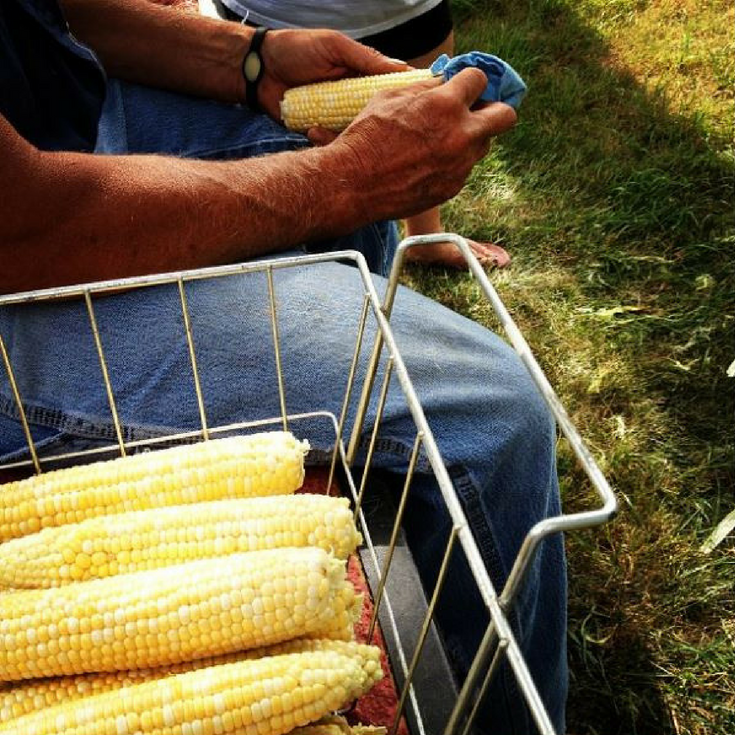 An added perk (and chore) is finding ways to preserve the bountiful harvest. 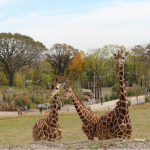 This past weekend, I tried to snap a couple quick pics (Hey! You can’t slow down the assembly line too much.) of my family’s favorite way to process our fresh corn. 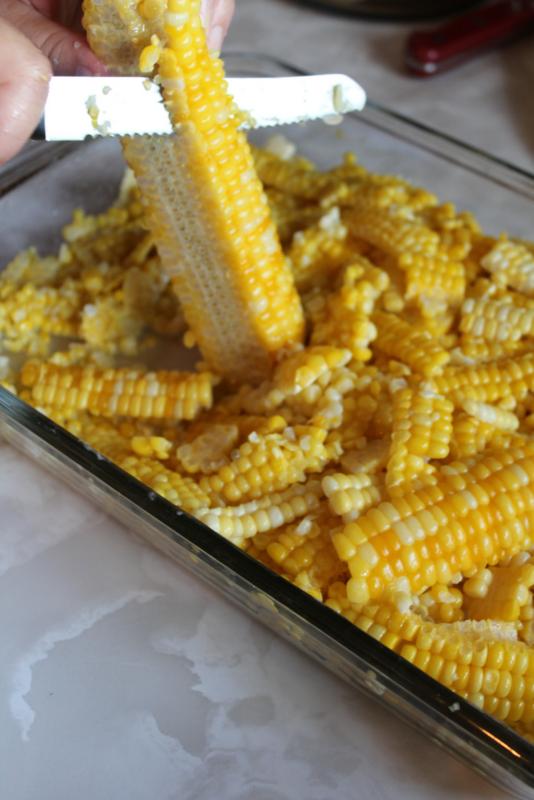 So without further ado here is “How To Freeze Sweet Corn”. So you have an abundance of fresh picked sweet corn. Now what? Well before you even get started in the kitchen. Pick a comfortable spot in the yard (preferably under a shade tree or on the tailgate of a truck) and start husking your corn. Remove all of the husks and as much of the silks as possible. Snap off and remove any “bad sections” from the ear at this time. 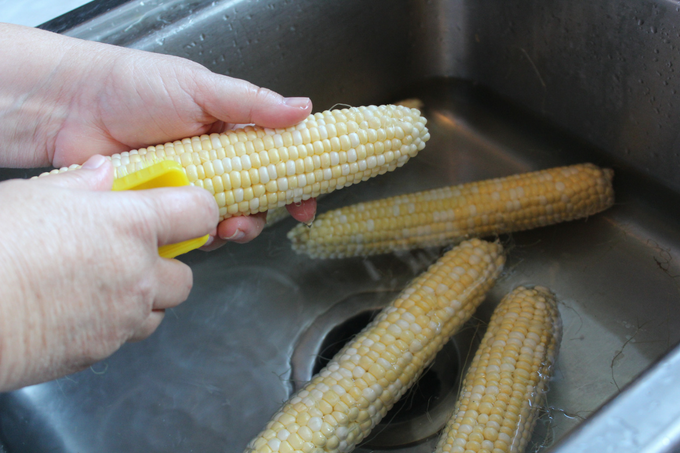 Next, fill your kitchen sink with cold water and clean each ear of corn. The best way to do this is by investing in a quality corn brush or vegetable scrubber. The soft bristles of the brush help to remove silks on the corn and makes sure the ear is clean. Once all of the corn has been cleaned it’s time to start the “assembly” process. Our family starts by putting two large stock pots on the stove and fill with water. Bring the water to a slow rolling boil. Start by placing about 3 to 5 ears of corn (depending on the ear size) into each stock pot. Let the corn cook for about 6 minutes. The corn should be tender, but not falling apart. While the corn is boiling, fill both sides of the sink with water. Add ice to the water. When the corn has boiled for approximately six minutes. Remove the corn from the pot and transfer to waiting ice water. “Dunk” each ear into the water. 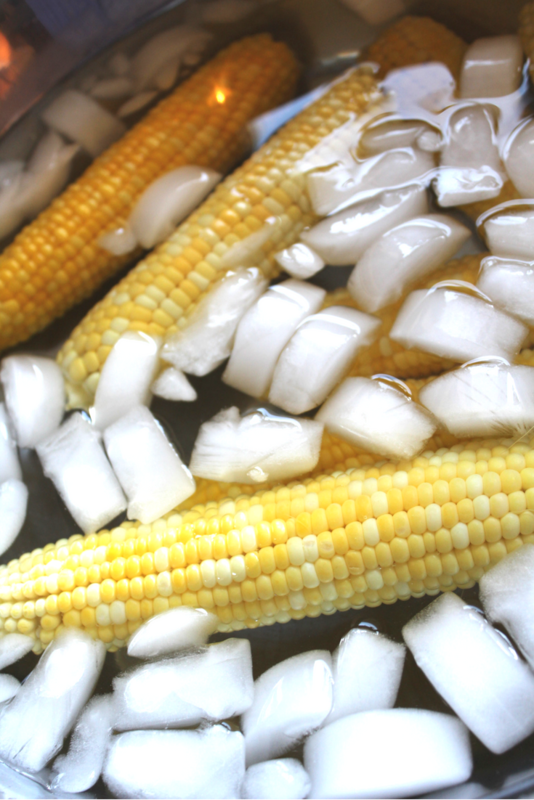 The ice water will stop the cooking process and start to cool the ear of corn. 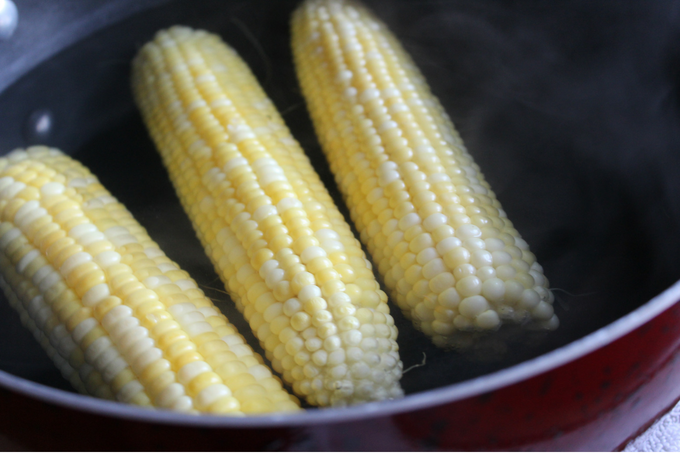 Once the corn is cool enough to handle, pat the ear dry on a kitchen towel before placing it into a large baking dish. (We always use a 9×13 pan). Then holding the ear tip, start slicing off the kernels with a sharp serrated knife, working around the cob in sections. Continue the steps above until all of the corn has been cooked, cooled, and cut. Once you have collected a good amount of kernels in the pan, go ahead and start bagging. 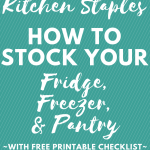 Make sure to use freezer bags and write the veggie name and year on the front. 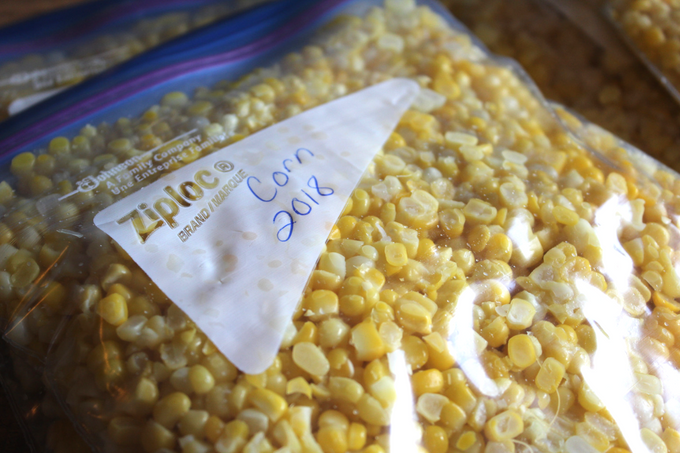 You can place whatever amount of corn into each bag you want or what suits your family best. For us we usually try to put two cups of corn into each quart freezer bag. 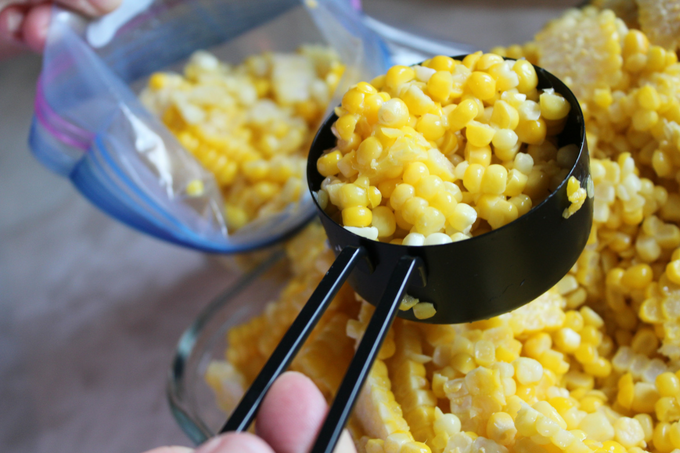 And presto into the freezer it goes and you have fresh corn that can be enjoyed all year long!